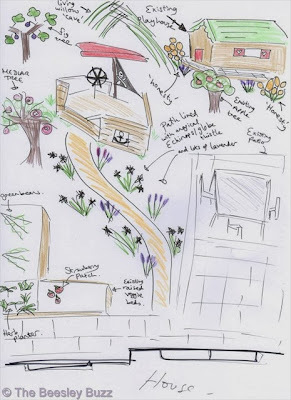 Our plan for our dream family garden with Activity Toys Direct. There's no doubt about it, gardens are places where things grow...whether you have grass that grows, a few pots with flowers in, a vegetable bed or a tree. Gardens are for growing. In the garden, no-one else directs them what they can and can't do - they are free to play. They are free to imagine, they can be whoever they want to be, nothing can limit them or stop them. In the garden, the ideas flow, their imaginations show, the creativity grows and then the 'chore' of doing their piece of writing becomes something they want to do and their excitement builds when they realise that their minds are free. They have space. Space to run around. Space to think. Space to explore. Space to allow ideas to come. So our garden truly is a huge part of our family's life. It's where bonds are built and strengthened when mum or dad join in a ball game. It's where siblings collaborate rather than squabble. It's where memories are made and time is shared. A couple of years ago we had some building work done on the house, and whilst the house improved, the garden was basically ruined. It became so full of builder's rubble, broken glass and all the grass turned to mud and so effectively because unusable. We couldn't bear to be without use of the garden, so we did get it returfed and the patio re-built but we were left with a blank canvas. The magic had gone. Our special garden with borders, and trees, with flowers for the bees - all of it was gone. We have gradually tried to put in a few special things like a little playhouse, a teeny-tiny apple tree, and even teenier fig tree and a little vegetable bed, but essentially it remains so plain compared to all the things that were there to discover before. So I took a look on Activity Toys Direct for inspiration. And here are our ideas for our dream garden...I say 'our' dream garden rather than 'my' dream garden because I think all too often adults make the buying choices about toys without asking for input from the children who will be using the toys the most. So we got the children to look on the Activity Toys Direct website to see what they thought. Interestingly, there was one item that appealed to every member of the family. We each kept our ideas quiet from each other so that we didn't influence each others decision and this item came out as a firm favourite on everyone's wish list. It would make a real centrepiece in the garden and would be usable for most of the year. It lends itself to hours of fun and imaginative play. And it is at the perfect price point for the 'toys' part of this challenge. It is also made with FSC certified wood, which is important to us all as it is something the kids have been learning about. It is the TP Toys Forest Pirate Galleon 2 priced at £437.99. Their second most wanted item was a water slide and this TP Toys The Original Aqua Slide, priced at only £26.95 could also go onto their wishlist and still fall within the £500 imaginary makeover budget and is perfect for water play in the summer. We really wanted the item/s we chose to be suitable for all three of our children and so the Pirate Galleon is absolutely perfect for a wide age range. We also didn't want to pick an item that only had a single use - we wanted it to be open to lots and lots of imaginary play. 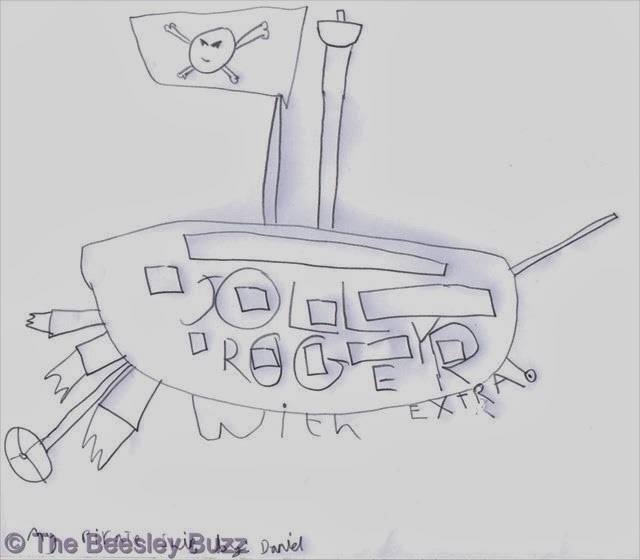 Again, the Pirate Galleon looks ready for a whole host of adventures. Having said that, because of J's ASD, he can find too-much open-ended choice overwhelming, so having a theme that can be used as a focal point - i.e. pirates - can actually help him rather than having a general play centre without any particular focus. And in case you needed any more convincing as to why this would be the absolute PERFECT choice for our family, here is a small selection of photos which show just how much all three of our children have enjoyed dressing up as pirates over the years! T even wore a 'Pirate Pong' hat on her very first day in the world. 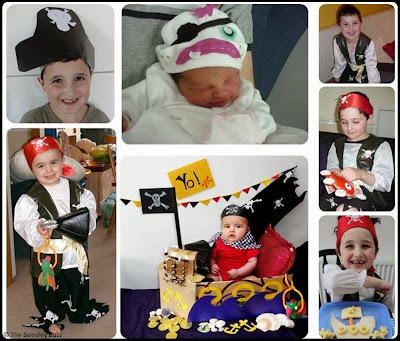 Even though they are all older now, they still love to dress up as pirates and D was making his own pirate hat from cardboard just a few days ago. But what about the rest of the garden, what plants and features would I chose to complement our wonderful Pirate Galleon centrepiece? Well what do all pirates go in search of? Treasure of course! This is where I would chose plants that are real treasures to me. I always love finding fruit and vegetables growing in the garden and we already have our little apple tree and fig tree that bear treasure in Autumn. We have some red strawberry treasures in our existing veggie bed. So what else? Well I have always dreamed of having a Medlar tree in my garden. The origins of the Medlar tree are rooted in Persia (just like mine as my mum was from Persia), and the tree bears unusual looking fruit that makes the most wonderful tasting Medlar jelly. Not many people seem to know about the Medlar tree making it a real hidden gem. Honesty is my favourite plant from my childhood - I remember finding the magical oval discs that shimmer and glimmer. What better treasure to find than that! Echinops, or the globe thistle, produces these perfectly spherical heads that have a purple hint to them. See these at their best when their spikes look perfect before the tiny purple flowers open and they really do look like magical treasures from a strange land. Then I would plant oodles of lavender and herbs. Lavender has so many uses - we make scented bags for the wardrobes with it, use it for soap-making and it can even be used in cookery! With all that lavender the bees and butterflies would be keen to visit and they are another treasure in themselves to look at. And herbs are just amazing for their scent and how they can be used in all sorts of dishes. Having our very own little brilliant chef in the family means that we can never have too many herbs. And finally a living willow 'cave'. So when our Pirate Galleon gets shipwrecked on some far off shores, we can find a cave to shelter in. I checked the prices for this selection of plants and it would fall within the £250 budget for the plant element of the challenge - A living willow tepee or tunnel can be purchased for around £50, a medlar tree for £30, and the other items are a lower cost than these and all fall within budget in total. 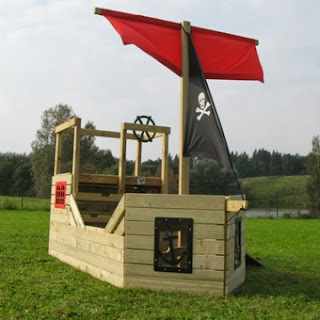 I have a feeling that the kids are very excited about the idea of having the garden as a space for playing pirates and finding treasure! 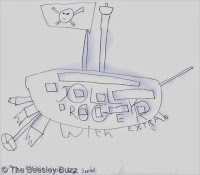 We found they had each been drawing pirate ships inspired by the pirate galleon they had seen on the Activity Toys Direct website. This blog post is an entry into the Tots100/Activity Toys Direct garden makeover competition. Find more information here. J's been collecting boxes, tubes and other 'junk' for weeks now, and building a steadily growing pile of stuff to build with. By now you will have realised that J is a huge Moshi Monsters fan. In fact, he is the self-proclaimed world's biggest Moshi fan. So when his chance came to spend time with daddy to build a new junk model, he jumped at it. He decided it was the day to build... a Moshling Castle! We spent ages designing the castle, working out how big it should be and how to fit it all together. Everything was ready. The design was simple. Then came the idea to have a slide so the Moshlings could get from the battlements down to the top floor. Then the slide to get to the downstairs. Then the dungeon! By the time the morning was over, and the tape was almost run out again, a new Moshling Castle had arisen from the scrap. Now in pride of place in J's room, the castle has been used every day for Moshi adventures. As there are still dozens of boxes left, I'm sure we'll back for more junk modelling soon! A couple of years ago, I remember reading on the Daily Growl over at Moshi Monsters (in the days when I actually had time to look after my online monster before T was born), about a project that Moshi had supported which was feeding porridge to 457 students in Malawi. We've loved Moshi Monsters for such a long time - and I will always be grateful to them for the difference that Moshi has made to my son's life (when he was at school he was told he had no creativity because of his ASD, yet since discovering Moshi Monsters he now spends hours on end designing and inventing his own moshling ideas as he has been so inspired by Moshi Monsters). But before reading the porridge story, I had no idea just how amazing, generous and caring Moshi Monsters is. 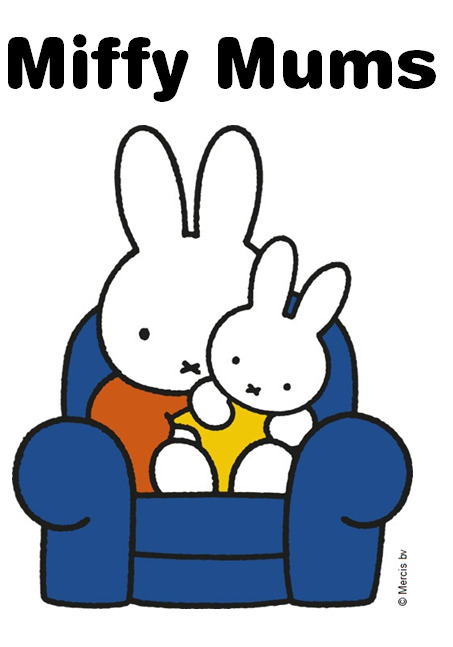 Since then, I have become aware of things they do behind the scenes that speak volumes about just how this mega huge thing that is Moshi actually really genuinely does care. And so it was no surprise to find out that Moshi Monsters will be supporting BBC Children in Need this year. 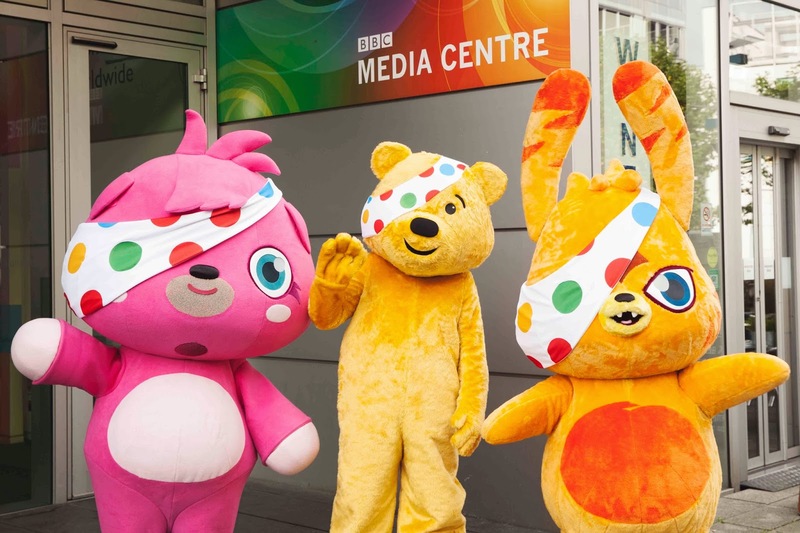 Poppet and Katsuma visited Pudsey sporting the iconic multi-coloured spotty bandana to celebrate the partnership. 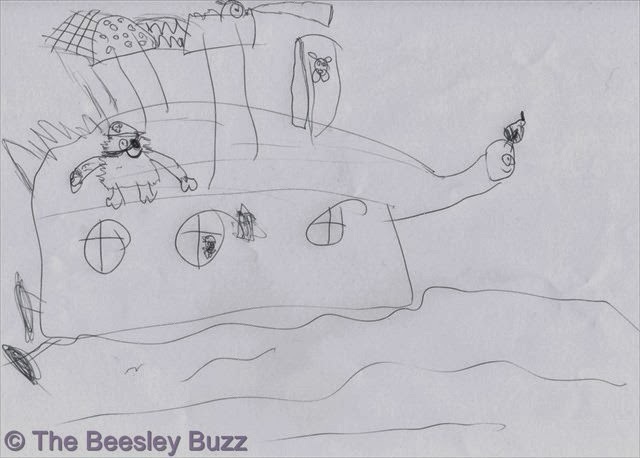 Whilst Moshi Monsters is J's number one love - he's a pretty big Pudsey fan too - so this news is music to his ears! 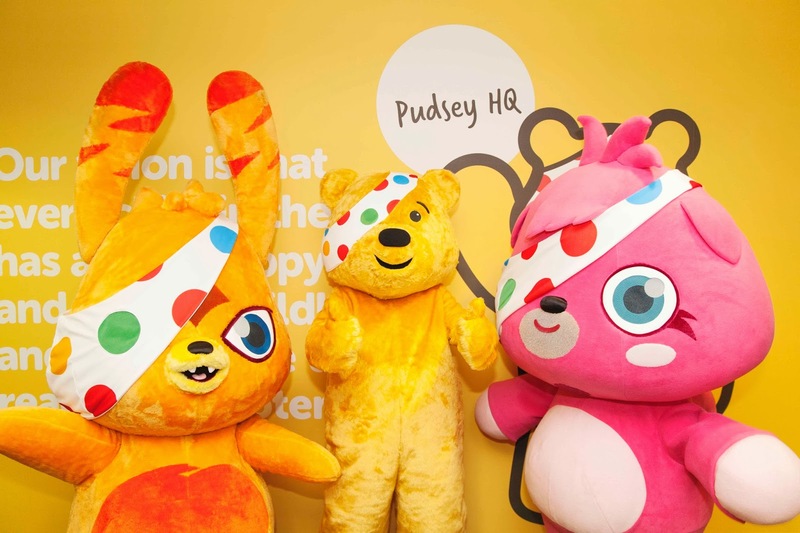 The activity was kicked off earlier this month when Pudsey stopped by Moshi HQ for a special broadcast, which aired on CBBC’s Newsround. 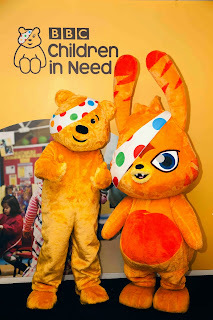 The BBC Children in Need Mascot was seen exploring Moshi HQ and was made available to be bought in game on MoshiMonsters.com, where players can purchase the famous bear with their in-game currency (Rox). Alongside this as part of the partnership, Mind Candy and Vivid Toy Group have created 30,000 limited edition Spotty Moshlings Collectors Tins, with £3 of each sale going direct to the charity fundraiser. “BBC Children in Need does a fantastic job. Everyone here at Moshi Monsters is delighted to help them and hopefully we will continue to raise lots of money to support disadvantaged children and young people.” said Michael Acton Smith, Founder and CEO of Mind Candy. Moshi Foundation is an independent charity set up in 2011 by Mind Candy Ltd. 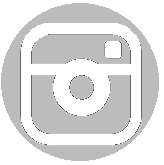 The Foundation is a grant giving organisation supporting the advancement of education, relief of financial hardship, sickness and poor health in children and young people anywhere in the world. It is run by a team of Trustees who review and assess all grant requests. It has previously supported a wide range of charities, including, Kids in Need Foundation, African Promise, Medical Detection Dogs, Mary's Meals and Charity: Water. The special BBC Children in Need Pudseys are now available on MoshiMonsters.com with the limited edition Spotty Moshlings Collector Tins available now. Photos courtesy of Moshi Monsters / 77 PR. No payment has been received for this post. We are happy to post this information as Official Moshi Bloggers and because we love Moshi Monsters and Pudsey! Since D recently started school after several years of homeschooling, he seems to really be into making things from paper - paper planes, paper hats, paper purses, you name it, he seems to be making it from paper, sticky tape and scissors. His room had become borderline fire-hazard with the number of items he had made so I had a tidy-up and put the paper-items into the recycling bin. To put this in context I usually find it really hard to throw out the things they make but this had just become ridiculous because there was so much of it with no sign of it being tidied up or for having been made for any particular purpose. 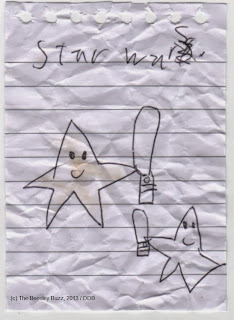 The very next morning...."mum...have you seen my paper planes/purses/hats I made for show and tell at school today?" Huge panic on my part - gathered together a pile of fresh paper, scissors and sellotape and explained it was probably easier to make some new ones than to try to find the other ones!!! 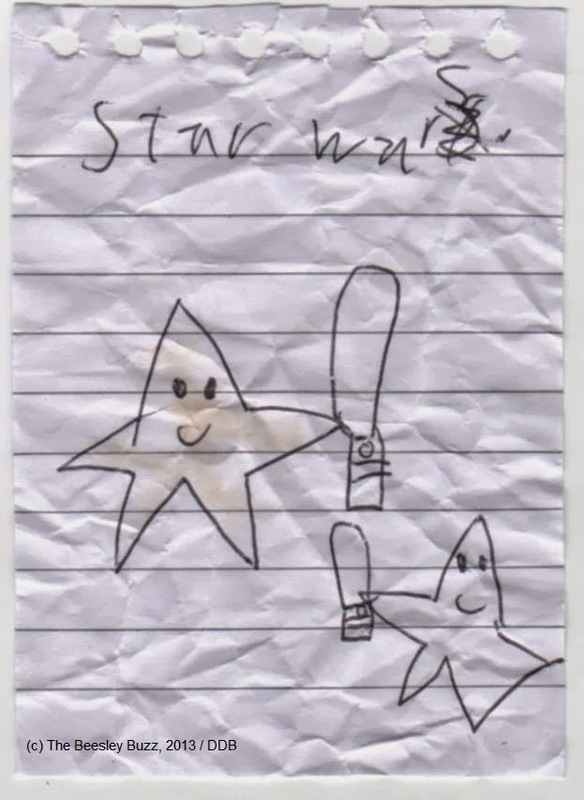 One thing I couldn't bear to throw out though was a little picture I found of two stars with light sabres entitled 'Star Wars' - I just thought that was too cute! ...half a dozen teachers, a couple of headteachers, a handful of doctors, consultants, psychologists, psychiatrists, and therapists. It's been a difficult week, hoping next week is better!